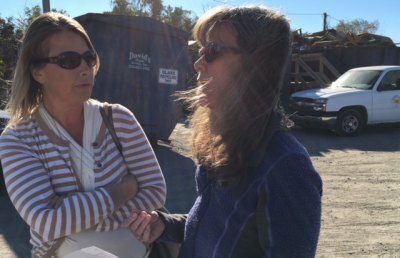 Ocracoke resident Beverly Meeker (left) explains her concerns to county manager Kris Noble. 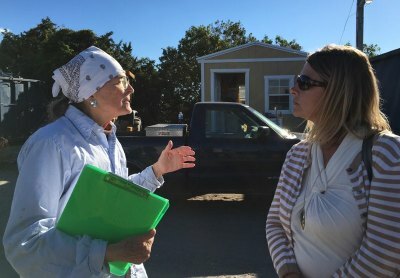 Hyde County Manager Kris Noble was on Ocracoke on Wednesday, October 24 to meet with residents concerning our dump, or, as it is known officially, the Ocracoke Convenience Site. She says that the county officials are very aware that there are problems with the not-so-convenient site. The contractor who is responsible for servicing the convenience site is David’s Trash Service. Their contract expires on January 1, 2019 and Hyde County is putting the contract out for bids. Ms. Noble says that there has been interest from other companies to bid on the service. There is some confusion as to whether glass can be put in the co-mingled recyclables. It seems that a small amount of glass can go in with the other recyclables but restaurants (or heavy drinkers) with large amounts of glass should use the container labeled glass. Kris listens to suggestions from Debbie Wells. Contrary to popular belief, the recyclables do get recycled. While our household garbage is taken to the East Carolina Environmental Landfill in Bertie County, the recyclables find their way to the East Carolina Vocational Center in Greenville. The county does receive an income from the recyclable materials. The primary comments from residents concerning the convenience site had to do with the smell and/or appearance and the inability of the contractor to haul off the garbage in a timely manner. Hyde County officials are aware that the area is unsightly but did spend more than $60,000 last year to address these issues. Among the improvements are grading and gravel around the site and plastic material woven through the fence to help block the view of the dump. To deal with the excess liquid dripping from the trash compactors, the county installed a leachate tank underneath. When the tank is full, it is pumped out by a tank truck. Although these measures have improved some the unpleasantness surrounding the dump, Ms. Noble acknowledged that the county knows that is more that must be done. The meeting attendees had many questions and comments. The construction dumpster is often full. 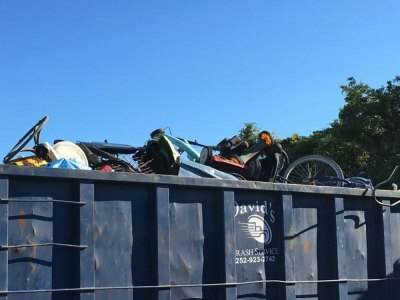 There is a proposal being explored that rather than hauling construction debris to the dump, contractors could rent containers and have them placed on their site. The county would split the cost of the container (dumpster) with the contractor. This would serve a couple of purposes. Rather than filling the convenience site containers with debris from large jobs, there would be more room for homeowners or those doing small jobs to dispose of materials. Secondly, builders would not have to load their debris into a truck or trailer, transport it to the dump, and then unload it. Having the container on site would save them valuable time. There has been positive feedback from some builders who have been contacted concerning this proposal. 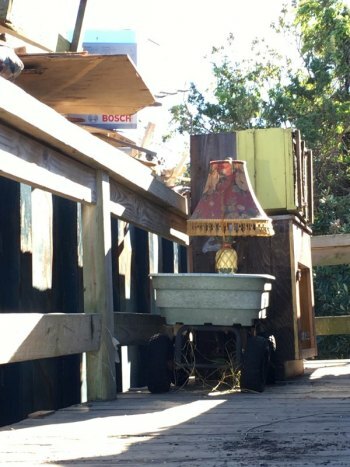 Who tossed out that lamp!?! Why can’t we have home pick-up? There are currently several private companies who will pick up commercial and home waste at reasonable prices. According to Ms. Noble, if residents want Hyde County to offer trash pick up it would require an increase in property taxes. We need netting to cover the tops of the dumpsters to keep items from blowing out during a storm. Could we open up both sides of the trash compactor, one side for household trash and the other side for commercial? Could we have a shed or some type of shelter where items that are still usable could be placed? Aesthetic improvements; could the box site not be as much of an eyesore? Could better grading or paving make the the site easier to keep clean? We need easier access to the containers such as ramps, steps, etc. similar to what is in between the construction containers so that people can put items in from the top. Could we make efforts to become a bagless community? People would either bring their own bags to the store or pay for bags. There could be an incentive. Could we move to a Pay As You Throw system where users are charged a fee depending on how much waste they dispose of? Could attendants help patrons unload trash or debris?